This is a joint giveaway with Momma Jorje and Natural Parents Network. You may enter at one site only. Please find the section marked "Win it!" for the mandatory entry and optional bonus entries. This is a giveaway from Boba, a baby carrier company which is offering our readers a giveaway of an Organic Boba Carrier 3G, a value of $160. 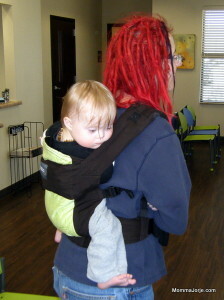 The Boba Carrier may be converted to a newborn carrier without an infant insert or any additional items and used well into toddlerhood. 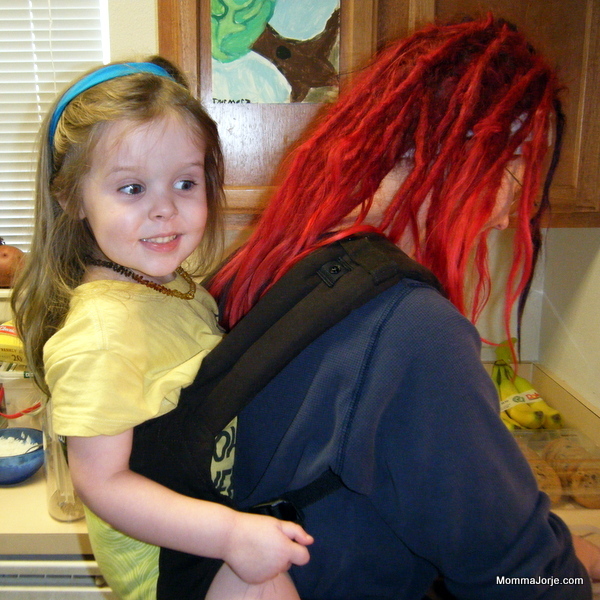 This carrier can be used for children ranging in size from 7-45 pounds! My Organic Boba Carrier 3G arrived, neatly folded in a pretty box with a full color instruction manual including step-by-step photographs (also available online). This photo does not do the colors justice. It is a beautiful carrier. The carrier has several different adjustments you can make, but it wasn't overwhelming. It only took a few minutes to have it on and ready to load with a child. You'll want help the first few times you load a baby on your back, but with practice I mastered loading a back carry alone. Spencer is about 20 pounds and is fairly easy to load onto my back. Sasha gets a bit jealous of him, though. On this day, she was sad and needing some reconnect time with me. She is 3½ years old and about 30 pounds, but I managed to load her on my back by myself after having practiced with Spencer. As you can see, she was thrilled to be on my back. She gets to sit on the counter and cook with me, but this was miles better! This photo from the Boba site shows the colors better as well as a front carry. According to their manual, this carry is fine from 15-30 pounds. You see how these two are face-to-face? I found that even carrying Spencer (20 pounds, remember), he was too tall. I had to look around his head and would also hit my chin on him. The back carry is for children from 20-45 pounds. I love that there is overlap there, so you can use it with whichever carry is right for you. I've used hiking backpacks, ring slings, mei tais and other carriers. This is absolutely my favorite carrier. 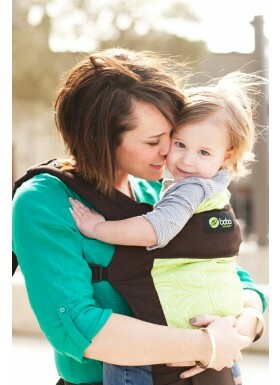 I loved my wrap for Spencer when he was a newborn, but the Boba 3G is so versatile, holding babies from 7-45 pounds! Boba Inc. is a group of dedicated people all working together to support babywearing, family travel, alternative learning, natural parenting, and other practices of secure bonding and attachment so that every parent can deepen their conscious understanding and appreciation of their relationship with their children. We recognize that there is no single formula to meet each particular child’s individual challenges and respect a mother’s innate ability to trust and know what is right for her own. If that doesn't sound like a very "Natural Parents Network" kind of company, I don't know what does! The company supports a lot of organizations that support natural parenting ideals (including Attachment Parenting International, among others). 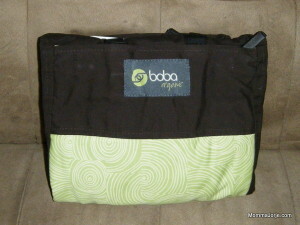 You can purchase your own Organic Boba Carrier 3G at Boba for $160. There are 3 different organic fabric combinations or you can choose from adorable prints if you don't choose organic. Boba's other soft structured carriers range in price from $120 to $125, and they have wraps from $38 to $60. You can also find Boba carriers on Amazon. For your own chance to win an Organic Boba Carrier 3G, enter by leaving a comment and using our Rafflecopter system below. The winner will receive an Organic Boba Carrier 3G. Contest is open to residents of the US only. MANDATORY ENTRY: Visit Boba and tell us one thing you have learned about the company! You must enter your name and email address in the Rafflecopter entry system for your entry to count, after leaving a comment on this blog post. This is a joint giveaway with Momma Jorje and Natural Parents Network. You may enter at one site only, and we'll be recording IP addresses to ensure that there are no duplicate entries. That said, please do visit and enjoy both sites! Contest closes May 25, 2013 at 11:59 p.m. Eastern Time. If we don't like a product, we won't be recommending it to you. I like that it works with older children too. I like the teething pads, my little guys used to chew on our Ergo straps all the time! My 2 sons and I would all enjoy the carrier. I've got a 2 year old and one due any day now! I would love this and could use it with my two youngest girls! Love the Blog! Thanks for sharing the babywearing love! I really like there stuff sacks and didn't know you could purchase them separately. I wasn't previously aware that the Boba has a built in infant "insert" Awesome! I've heard this is the best carrier out there! I love the sucking pads. I don't know if it's an accessory, but I would love a Mini for my daughter! The drool pads would also be great. Selling everything to be free together. I like their company's concept. I like that they have wrap and boba air! I like the foot straps and the carrier sack bag. My daughter is tall so the stirrups would be nice for her! I'd need to get the teething pads. I'd be the primary user if I won. I have an active 3-year-old and a nine-week-old baby, and I need my hands free! I learned that Boba works hard to ensure proper body mechanics for children being carried in their products - keeping them "froggy style" with features like the foot straps, etc. I love the teething pads accessory! I would enjoy carrying my newborn in this carrier if I won - I'm sure my husband would try it out too! I'd love the boba air, my LO gets SOOO hot, I think it would help to have something lighter to carry him in. I think I'd like the foot straps if I had a Boba, but I'd also love to get a "Mini" for my little girl and her baby dolls!